FBI Deputy Director Gordon Cole: He's dead. In some ways this is best structured Twin Peaks episode of the new series. Strange, surreal, violent, funny with plenty of plot developments. Becky is indeed Shelly and Bobby Briggs wayward daughter and Steven is more than her no good boyfriend but her husband. He is cheating on her as well as taking money from her. When she goes on a shooting rampage, we get some character moments between Shelly, Bobby and Becky. Indeed when we first encountered Bobby Briggs at the Sheriff's department, I thought he would be a crooked cop but now we know that the mouthy, cynical one at the Sheriff's department is bent. 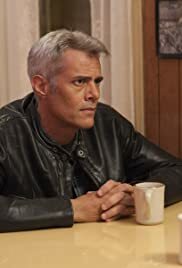 When there is a random shooting incident through the window of the diner and Bobby Briggs discovering a distraught woman in a car with a sick woman, it seems that there is some dark cloud hovering above the town of Twin Peaks which has unleashed an explosion of violence. The FBI investigation in Buckhorn is also gathering pace. Both Gordon and Albert are shown to have a supernatural edge which we so far thought only Agent Cooper possessed. They see a mysterious figure moving about which suddenly kills Hastings while Gordon has a vision where he sees those notorious woodsmen. They also discover the headless body of a woman with some coordinates. The Mitchum brothers cannot wait to get their hands on Dougie Jones, Bradley Mitchum is just counting down the hours until he gets to kill their arch nemesis Dougie. Yet a strange dream Bradley has had means Dougie may not be their enemy especially as Dougie has been dispatched to meet the Mitchum brothers with a $30 million cheque as their fire was deemed to be accidental. All of a sudden Dougie is having cherry pie with the Mitchum Brothers in a restaurant where Dougie meets the old lady he help win a jackpot at the casino. She thanks him for changing her life. David Lynch has set a very high standard in this episode.